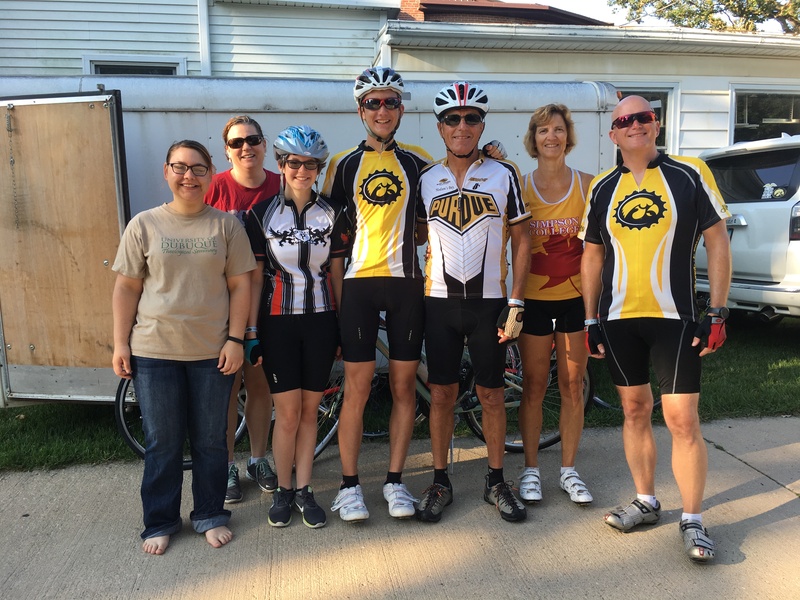 What does a typical RAGBRAI day look like? Well, it depends. Some people leave very early in the morning, riding in the dark. The folks at Swaledale UMC said that their first customer for cinnamon rolls rode through town at 4 a.m.! Our Circuit Rider team sets our alarms for between 6 and 6:30 a.m., aiming for a 7:15-8:15 a.m. departure, depending on how many miles we are riding. We have stayed in the homes of either United Methodist pastors or lay persons in the towns where we are staying. They have usually generously provided breakfast food so that we don’t have to stand in long lines at the first stops of the day. After we pack our suitcases in the trailer, fill our water bottles with Gatorade, and pump up our tires, we share a scripture for the day, pray for safety and God’s blessing upon the riders, and take a picture with our hostess (Rev. Kayla Lange, Cresco UMC). Vendors station themselves along the entire route, selling everything from breakfast burritos, cheese curds, Amish pies, ham balls, brats, pulled pork and chicken, and Asian food. Many of the same vendors move to the host town and provide food at night as riders party and listen to live music. How fast do you need to ride? Everyone can ride at their own pace, depending on their fitness level and goals. Some teams whiz by at 20 miles per hour, while others mosey along at a leisurely pace and take all day to finish. Slower riders stay to the right, and faster riders pass on the left. There is no particular time when people have to be finished for the day. What happens if you get hurt or can’t go on? At RAGBRAI, riders will immediately offer assistance if someone falls off their bike or has a medical problem. I’ve seen at least six ambulances every day attend to riders with medical issues. If riders can’t continue on a given day or have a mechanical issue with their bike, sag vehicles pick them up along the route and take them to the next overnight stop. 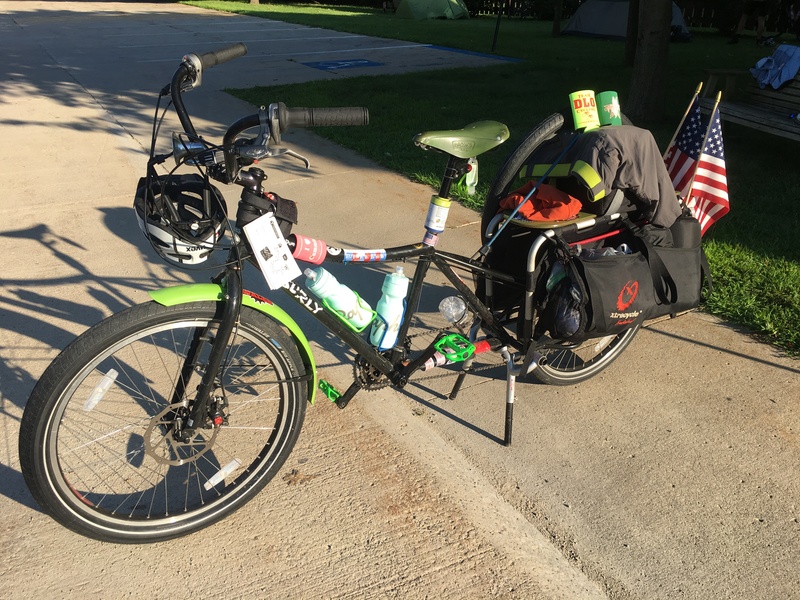 Why do people from all around the world ride in RAGBRAI? This morning, before we started Day 6, I talked with a rider who is originally from England but now lives in Florida. I was intrigued by his bike because I hadn’t seen one before. He called it a “a carrier” bike. Duane and his riding partner are self-contained, carrying everything they need on their bikes, Duane has clothes, etc., and his partner has the tenting equipment. We had a wonderful conversation. Today’s ride had lots of hills, which made for a challenging day. We are enjoying the hospitality of Pastor Kim Gates and St. Paul’s UMC in Waukon and will finish our ride tomorrow by dipping our tires in the waters of the Mississippi River. But before that happens, we have some very steep ascents and descents and miles to go before we sleep. 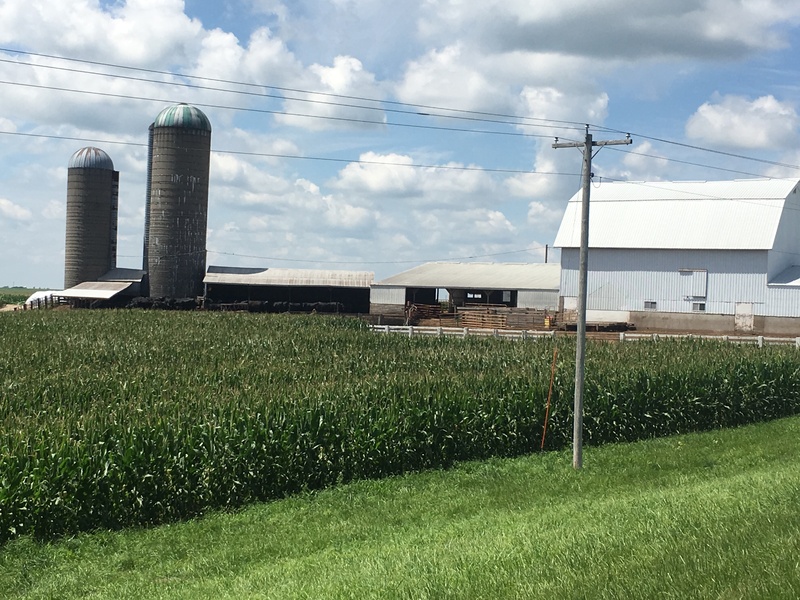 Monday’s blog will be my final update and reflections on RAGBRAI. Thank you for the picturesque commentary. I am learning a great deal about a subject that previously had very little interest for me. Although I am not quite ready to join you. Bless you for all you are doing.